In other gaming news, I'm in the midst of running a Rogue Trader campaign for a group of friends which currently has them caught in the Dark Eldar's evil clutches. I've been vacillating between Craftworld or Dark Eldar as the counterpoint force for the Harlequins and ended up coming down on the side of the denizens of Commoragh. This is, in part, because I have a significant amount of leftover Dark Eldar bits and kits from the last go around a few years back, and I felt it was better for the pocketbook to finally utilize those models rather than buy a whole new army from scratch. For fun I thought I'd lead off with the head honcho and picked up one of the new plastic Archon models. I wasn't a big fan of the default "both weapons crossed over his chest" pose, so did some rooting around for alternate arms and with a little cutting was able to come up with something a little more open and at least a little more dynamic, with the sword and head following the flow of the cape and chains. Got him more or less finished off over the last few days, just a few more little details to pick out/clean up, then he'll be ready for static grass and sealant. Going with purple armor plates this go-around, with a jade green as the spot color - that will be a bit more predominant on larger armor plates and so forth on upcoming models. 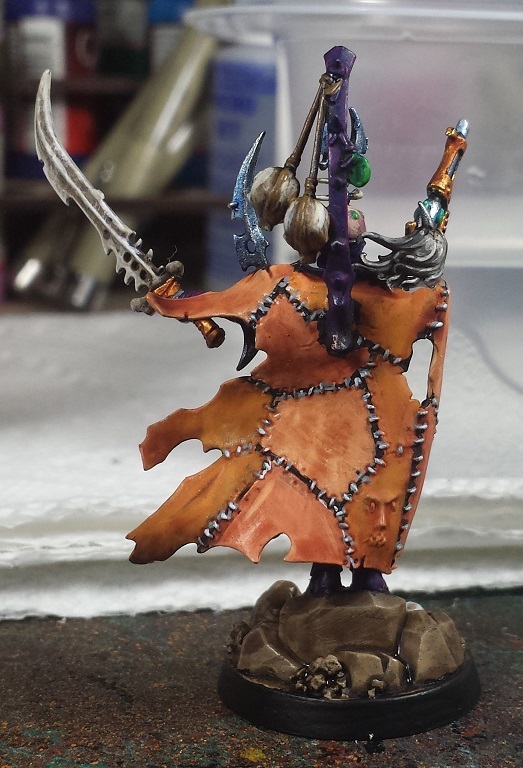 Had fun with the flayed cloak, tried to get a couple different skin tones in there to give it a patchwork feel. He's rather creepy! Next up for the Dark Eldar are the Court of the Archon and his Raider, though they're sitting unassembled in a box at the moment. Next up on the painting desk however are more of my beloved Thousand Sons - set the batch painting machine for "A whole mess (likely literally) of red!" That's looking really nice. You've managed a really nice and subtle effect on the purple of the armour - any particular method you used, or is it just careful highlighting? To echo what Andrew said the armour is looking really nice. That cloak is perfectly grim chief. Really lovely work on the armour and cloak dude! Though I think the tone of metal on the gun and sword hilt are very similar to the cloaks colour tone and it feels like it becomes the most prominent colour on the model. Just my opinion though :) great stuff! 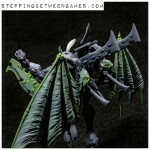 The cloak is awesome, are the stitches metallic, so they're actually staples. If so that's a neat touch. Nice fix! What the hell is with GW and their static poses these days? They have all the sculpting tools and plastics in the world and we get dynamic character models standing still o_O BAH! More creativity for us I guess! Repose looks WAY better than the bog standard. Well done. Like how you've painted him too. My group's been wanting me to run a Rogue Trader campaign for ages, but I've resisted. Something about the FF rules that I just don't like that much. 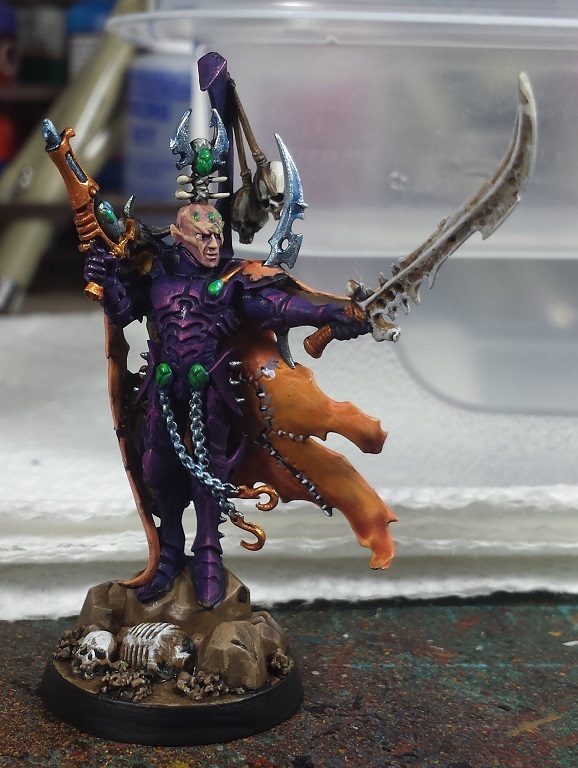 And wery well painted Archon you got here, not my cup of tea when it comes to their model range tough. I'm with you on the new pose for your archon. There seem to be two schools of thought on sculpting miniatures.Action poses and display poses.They both have their merits, but the latter are too static for my tastes. They work well for robots and other inanimate constructs, like the older boxy dreadnoughts. That is a much better pose and a really good looking paint job. You've stirred up my desire to paint eldar again. I can see where they were going with the default pose, but really putting a few options in the box wouldn't have hurt. 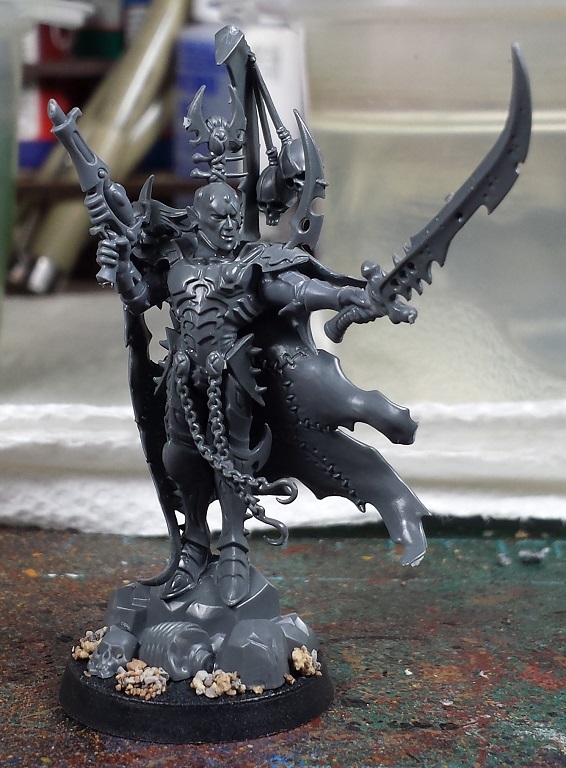 Wow, way to turn that model around, your new pose on him looks great and I think highlights all the cool bits on him, like the creepy skin cloak. That purple armor looks fantastic as well. I like it a lot, the purple fade on the armour looks really good too! Nice! I like your open pose better than the stock one. That pose is so much better then the original. Great work as always!